If you are in Dublin, Ireland, tomorrow, July 1, 2012, please drop by the Speed Show at Central Internet Cafe (20h - 22h). 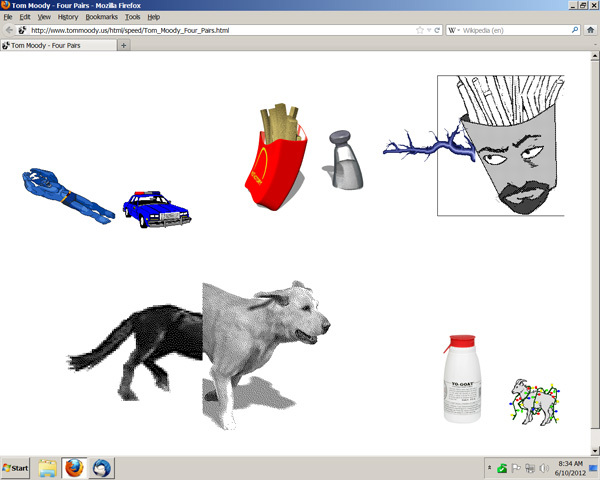 Nora O Murchú picked some of my dump.fm GIF pairs and I arranged them on an HTML page. The screenshot above is a shrunk-down, non-moving version. Many thanks to her for including my work. Many people had a hand in the images that ended up in my Four Pairs (2012), but as the electronic duo Voice Farm sang in the 1980s, "It's my idea now." Update, July 4, 2012: The HTML page I made for the show is Four Pairs, 2012. The optimal screen resolution for viewing is 1280 (w) X 1024 (h) or larger.